Tell us about the glass that you need and we’ll send you a free quote. The largest RV and specialty vehicle windshield glass supplier in the industry. With more than 40 years in the auto glass business, Coach Glass understands RV and specialty glass applications. We are your industry partner and want to help you grow your business. Whether you are an original equipment manufacterer or in need of aftermarket glass, we are here to help. We stock a large variety of glass products from windshield glass to side glass for motorized and towable recreational vehicles, fire apparatus vehicles, charter bus and motorcoaches, school buses, transit vehicles, heavy equipment, medical vehicles and much more. We are also equipped to source the highest quality glass for high-speed and light rail applications. Get a quote for your desired glass product or contact us to talk about your product development needs. Subscribe to receive notifications about new products, company news and upcoming events. Learn more about our company and deepen your knowledge about windshield and side-glass installation and products by watching our videos. We have a team of glass specialists available to guide you in developing the best windshield or side-glass product for your project. Learn more about our engineering support and extensive capabilities today. Our four strategically located distribution centers allow us to store your glass inventory conveniently close to you. We also offer local delivery and will-call at each location. When you call Coach Glass, a real person answers the phone, never an automated answering service. Our seasoned customer service representatives and sales team are ready to listen to your needs and find the best solution for you and your company. Learn More. 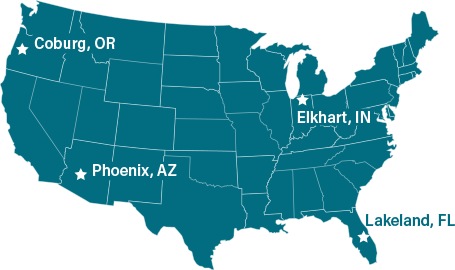 Our warehouse locations allow us to serve the United States, Canada and Mexico with quick cost-effective shipments in addition to local delivery and will-call. Coach Glass is skilled in product design, waste reduction, supply-chain analysis, packaging design and much more. Explore our capabilities and partner with our engineering team. We take pride in offering you the best shipping record in the industry. With a product like glass, making sure your shipment arrives quickly and without damage is critical. That is why we have developed proprietary packaging to accommodate all orders, large and small. Most orders ship the same day! We have the inventory and warehousing space to stock, package and ship your product so you don’t have to. Our longstanding relationships with our freight partners and our glass handling expertise save you money and time. Learn More. We stock more than 18,000 products for RV and specialty vehicles including windshields, side glass, back glass, moldings, gaskets and more. We are your best source for old and discontinued glass and accessories. I just wanted to fire off a quick message and thank you for the excellent pricing, delivery time and exceptional level of service. I look forward to doing more business going forward. The clear leader in the glass industry; no chips, cracks or bugs about it.